Week 14 brought us our first true snow game of the year, along with a potential season-ending injury to one of the league’s MVP candidates in Philadelphia’s Carson Wentz. Still, we saw plenty of big performances on both sides of the ball, so let’s first take a look at the Sunday Standouts on the offensive side of the ball. The Los Angeles Rams only put the ball in Todd Gurley’s hands 16 times, but that was still enough for him to make a huge impact. Forcing seven total missed tackles on those touches, and averaging 5.1 yards after contact per carry, he produced an elusive rating of 222.1, which currently ranks second among running backs this week. The Chicago Bears gave their fans reason for hope after what has been a long season, with three standout performances on the offensive side of the ball this week. Up front, center Cody Whitehair allowed just one hurry from 34 pass blocking snaps, giving him a 97.8 pass blocking efficiency rating. He was even more dominant as a run blocker though, producing a PFF run blocking grade of 93.6, the most of any player in the league so far this week. 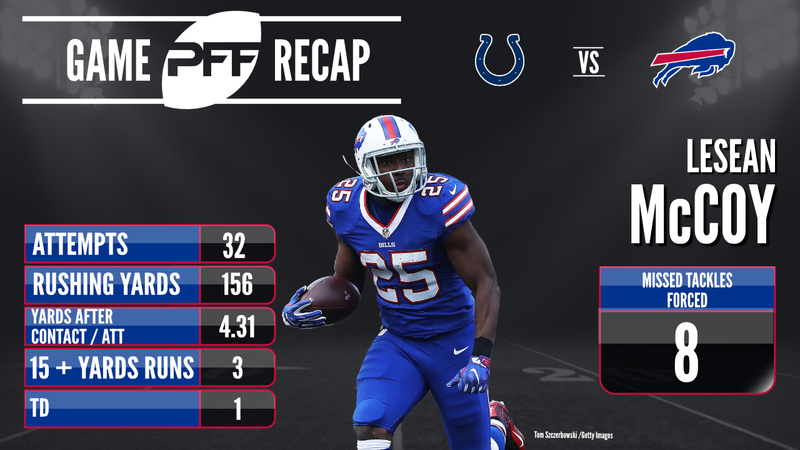 With the heavy snow fall before and during the game, it made sense that the Buffalo Bills would rely on running back LeSean McCoy, and that’s exactly what they did. McCoy carried the ball 32 times in the win, averaging 4.31 yards after contact per carry, and forced eight missed tackles, good for a 107.8 elusive rating. The Los Angeles Chargers look unstoppable right now, and are starting to earn the title of the team you don’t want to see in the playoffs. 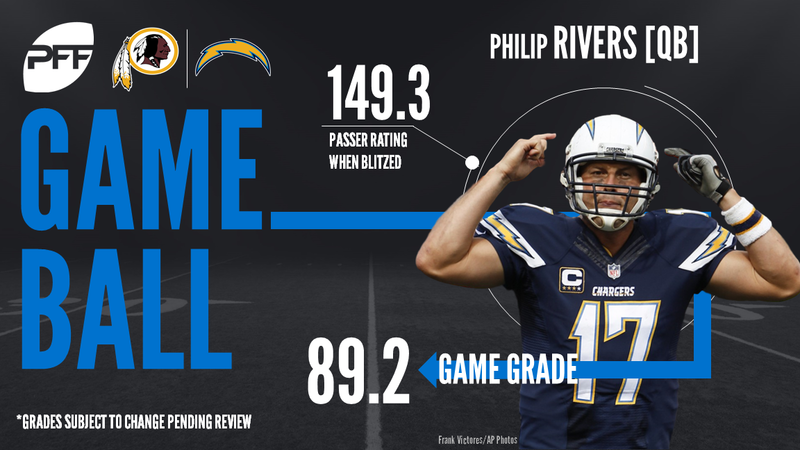 Quarterback Philip Rivers was once again in top form and while he had 13 incompletions on the day, eight of those came on drops, throwaways, batted passes and plays where he was hit as he threw. All that added up to an 80.0 adjusted completion percentage which is tied for fifth so far this week. This was the performance that Bears fans had been waiting for since the team traded up to select quarterback Mitchell Trubisky in the draft. Completing 25-of-32 passes on the day, the rookie saw three of his incompletions come on a drop, a batted pass and a spike, giving him an 86.7 adjusted completion percentage which ranks third so far this week. Another key to the Chargers revival in the second half of 2017 has been the play of tight end Hunter Henry. In the win over the Washington Redskins, Henry picked up 50 yards from 20 snaps in route, good for a 2.50 yards per route run average, which currently ranks third for all tied ends in Week 14. Henry wasn’t the only tight end who stood out on Sunday, with Trey Burton of the Philadelphia Eagles also standing out. On top of scoring a touchdown, Burton also caught all four catchable passes thrown his way, giving him a perfect 0.0 drop rate on the day. San Francisco 49ers offensive tackle Joe Staley found himself on the Sunday Standouts list a week ago, and he is back again this week after another top performance. From 35 pass blocking snaps he didn’t allow a single sack, hit or hurry, giving him a perfect 100.0 pass blocking efficiency rating. Key to the Detroit Lions win over the Tampa Bay Buccaneers was the play of wide receiver Golden Tate. On top of forcing two missed tackles to take his position leading total on the season to 20, Tate also caught all seven catchable passes thrown his way for a perfect 0.0 drop rate. The third member of the Bears to earn a spot here, wide receiver Kendall Wright was Trubisky’s top target on the day. From 27 snaps in route, Wright picked up 107 yards, giving him a 3.96 yards per route average, which is currently the best mark among wide receivers this week.